This weekend I made some slap yo momma hot sauce. I mean this salsa is so hot it'll make you wanna slap yo momma! I logged into Bingo Anywhere last night and found that the Hot Habanero slot was calling my name. I was still in the mood for some hot stuff. Bets range from 5p up to 50p per line. You can bet up to 3 coins on all 15 lines. That's pretty steep in my book so I set my bet to 75p per spin. A few spins in and I hit four sombreros across the top line with a wild for £2.50. The symbols include tacos, margaritas, donkeys, tamales, piÃ±atas and of course, habaneros. I had to laugh when I saw the tacos do a little dance. They shake it if you hit two or more on a pay line. I was hoping to see the bonus round before I ran out of bingo bucks. Three of the gold toothed man wearing a sombrero launches the bonus round. My wish came true. The Fortuna Wheel spun just for me. The wheel of multipliers spins. As long as you don't land on a duplicate a multiplier, you can continue to spin the wheel. I was four spins in and up to £20.25. 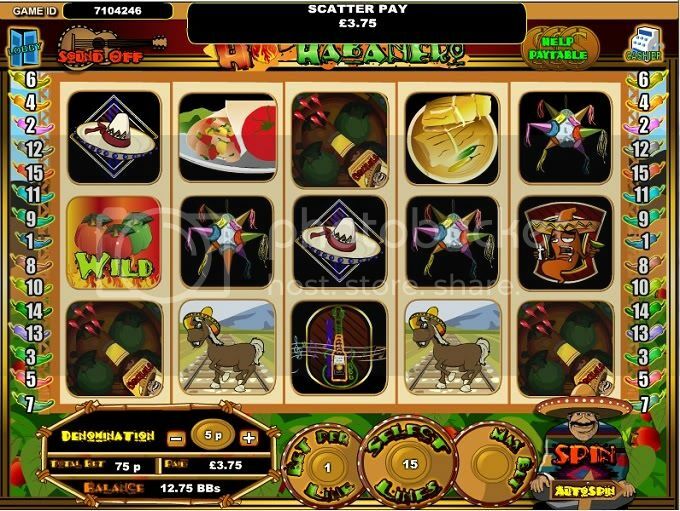 It was seven spins for me with a bonus prize of £31.50. The margaritas were looking mighty tasty. I debated whether or not to make one. I took a few more spins and couldn't shake the desire. A margarita would go very nicely with some chips and salsa. I headed off to the kitchenâ€¦.